A police officer in Columbia, SC caused a wreck on Friday morning, December 21st. He has been charged with a DUI. According to incident reports, 55-year-old officer Harold Julius Caldwell responded to an emergency call at the Hampton Hill Condos in Columbia at 9 AM. As he steered his car into the complex’s parking lot, when he hit a sign, then a wood and brick fence. A privately-owned risk management team assessed Caldwell, determining that he was intoxicated and driving under the influence, which made him wreck his vehicle. City police are required to independently test city employees for drugs and alcohol at a hospital, in order to achieve impartial results. The test determined that Caldwell was under the influence at the time of his arrest, and he has been charged with a DUI. Caldwell is currently suspended without pay. Chief Scott says Caldwell will be fired next week. Currently, he is being held at the Alvin S. Glenn Detention Center. According to the Department of Motor Vehicles’ website, if you are licensed to operate an automobile or other motorized vehicle in the state of South Carolina, you have implied that you consent to chemical testing if you are stopped by police for a suspected DUI. This law is called Implied Consent. Sometimes, officials might require a blood test, even if a warrant has not been issued. Legal consequences are listed by ascending blood alcohol levels. Jail sentences for a first DUI can range from 48 hours to a maximum 30 days, although community service can be given in lieu of jail time. Fines can range up to $400, plus court costs and fees. You will additionally lose your driver’s license for six months. Jail sentences for first DUI charges can range from 72 hours to a maximum 30 days, although community service can be given in lieu of jail time. Fines can range up to $500, plus court costs and fees. Jail sentences for first DUI charges can range from 30 days to a maximum 90 days, although community service can be given in lieu of jail time. Fines can range up to $1,000, and you are required to enroll and successfully complete an Alcohol and Drug Safety Action Program (ADSAP). South Carolina has some of the stricted DUI laws in the country. Do not let charges or a conviction prevent you from seeking job or educational opportunities. You still have rights, even if you face a court date. 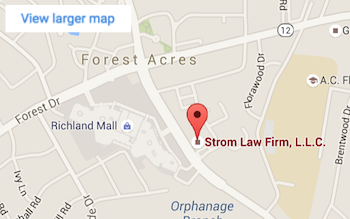 The Strom Law Firm can help with DUI charges in South Carolina. We offer free, confidential consultations, so the facts of your case can be discussed with impunity. Do not hesitate to contact us. 803.252.4800. Do you need a Columbia S.C. Probation Violation Lawyer?